Fukushima offshore wind consortium, which consists of Marubeni Corporation (Project integrator), the University of Tokyo(Technical advisor), Mitsubishi Heavy Industries, Japan Marine United Corporation, Mitsui Engineering & Shipbuilding, Nippon Steel & Sumitomo Metal Corporation, Ltd., Hitachi Ltd., Furukawa Electric Co., Ltd., Shimizu Corporation and Mizuho information & Research, is proceeding with Fukushima floating offshore wind farm demonstration project (Fukushima FORWARD) funded by the Ministry of Economy, Trade and Industry. In this project, existing 2MW floating wind turbine, 7MW floating wind turbine and substation are now under operation and 5MW wind turbine will be installed in July 2016. 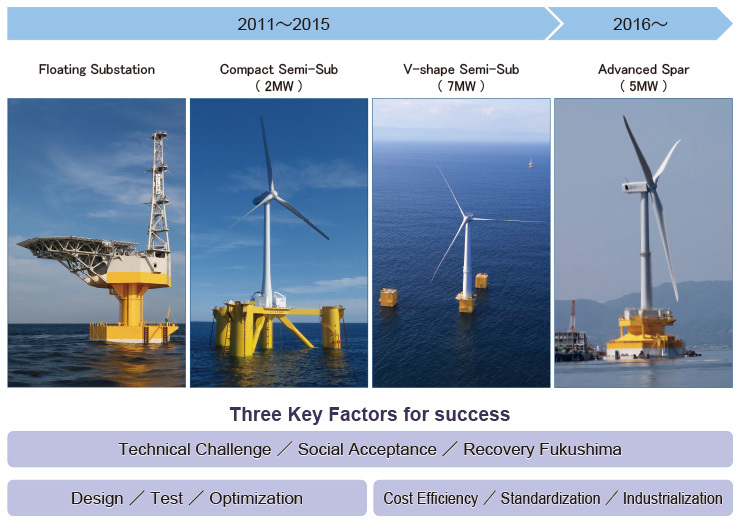 When this work is done, those will become the world largest floating wind firm and clarify safety, reliability and economic efficiency. 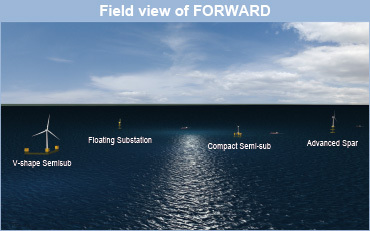 This project will establish the business-model of the floating wind farm and contribute to future commercial projects. The consortium members are also expected to learn know-how of floating offshore wind farm, which will be one of the major export industries in Japan. The Fukushima FORWARD project believes to help Fukushima to become the center of new industry which will create new employment in this region recover from the damage of the Great East Japan Earthquake in 2011.